'A real gem. We don't really need another singer-songwriter, but when they're this good, you just have to rearrange the furniture and make room'...Jackie Hayden, Hotpress. 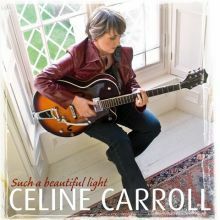 'Irish chanteuse and soulful songwriter Celine Carroll delves into a rich vein, mining affairs of the heart to create a collection of melodic gems on her latest album, 'Such A Beautiful Light'. Multi-instrumentalist, composer and performer Carroll captivates the listener with jazz-tinged tracks like I Believe In Love, Sweet Heart Of Mine and I Remember A Time. Joining Celine on stage will be Jerry Fehily (Ex-Drummer..Hothouse Flowers), Johnny Campbell Bass), Paul Seymour (Keys) and Siobhan Lennon (Backing Vocals). A guaranteed night of pure melody and laid-back grooves.